The budget carrier continued to deliver solid earnings growth in an ultra-competitive fare environment. 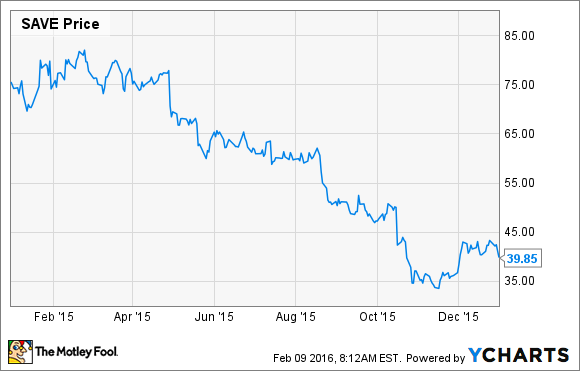 2015 was a tough year for Spirit Airlines (NYSE:SAVE) investors. While Spirit posted strong earnings growth each quarter, it had to lower its margin guidance twice during the year. Furthermore, it saw steep declines in unit revenue, particularly during the second half of the year. As a result, investors bailed on Spirit Airlines stock, causing it to fall nearly 50% in 2015. Spirit Airlines 2015 Stock Performance. Data by YCharts. However, Spirit seems to have stabilized its performance. On Tuesday, it reported solid results for the fourth quarter and a relatively good outlook for Q1 and the rest of 2016. Data source: Spirit Airlines Q4 earnings release. What happened with Spirit Airlines this quarter? The last few months have been eventful for Spirit Airlines. In October, management projected that Spirit's Q4 operating margin would be about 17.5%, compared to 19.9% a year earlier. This would have broken a long streak of earnings growth. This enabled Spirit to improve adjusted EPS to $1.02 from $0.80 a year earlier. For the full year -- despite all the drama -- Spirit's adjusted EPS climbed 35% to $4.37, driven by lower fuel prices. Spirit Airlines also had an unexpected change at the top recently. CEO Ben Baldanza resigned last month after nearly a decade at the helm. He was replaced by Bob Fornaro, the former CEO of AirTran, who has been a member of Spirit's board since 2014. Spirit's earnings report gave Fornaro his first opportunity to talk to investors about his plan for the airline. He intends to place a lot of his focus on operational reliability and customer satisfaction, two areas where Spirit has come up short in recent years. However, Fornaro doesn't intend to make wholesale changes to what he sees as a proven, successful business model. Fornaro also dismissed two rumors that have been circulating since he took the helm. First, he stated that Spirit will remain a high-growth carrier. Its long-range plan to increase capacity 15% to 20% annually remains intact. Second, Fornaro said the company has no merger plans. New CEO Bob Fornaro intends to maintain Spirit's high growth rate. Image source: Spirit Airlines. One area where he did show more flexibility than Baldanza was route planning. In recent years, Spirit has challenged legacy carriers like American Airlines (NASDAQ:AAL) by growing rapidly in their biggest hubs. American Airlines responded by matching Spirit's fares. American's fellow legacy carriers have also moved in that direction. As a result, while there are a lot of potential customers in these big markets, pricing has been weak. To avoid these pricing battles, Fornaro expressed an interest in entering more small and midsize markets -- i.e., routes that are unserved by American Airlines and the other legacy carriers. Spirit Airlines CFO Ted Christie stated during the earnings call that the pricing environment has been stable for the past few months, but fares remain very low. Spirit expects sequential unit revenue improvements throughout 2016 as comparisons get easier. On the cost side, while fuel prices continue to decline, the year-over-year benefit will be much smaller in 2016. Spirit expects non-fuel unit costs to decline 0% to 1% for the full year, with larger declines in the first half of 2016 and year-over-year increases in the second half of the year, driven by the timing of maintenance events. Based on the current revenue and cost outlook, Christie projected that Spirit will post a 19% to 20.5% operating margin in Q1. That would be down from 22.7% a year earlier, driving a modest year-over-year decline in EPS. However, if the revenue environment continues to stabilize, Spirit could return to EPS growth later in the year.